Today I want to tell you musicians out there about a great guitar. 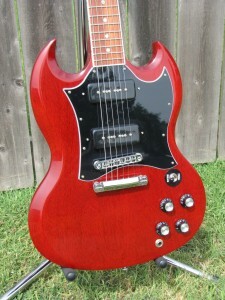 The Gibson SG Classic. I first played one of these back in 2009 at a Guitar Center store in Fayetteville, AR. I really liked the sound of the P-90 pickups in it. 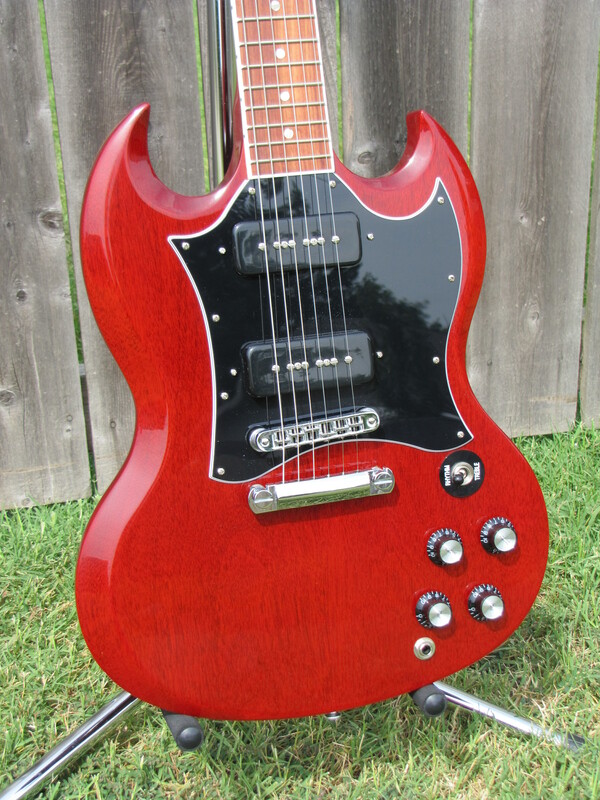 So I ordered one from my favorite Guitar Center store in Tulsa, OK, and then midstream, decided to get the SG Standard for a few more dollars and get the hardshell case with it free. 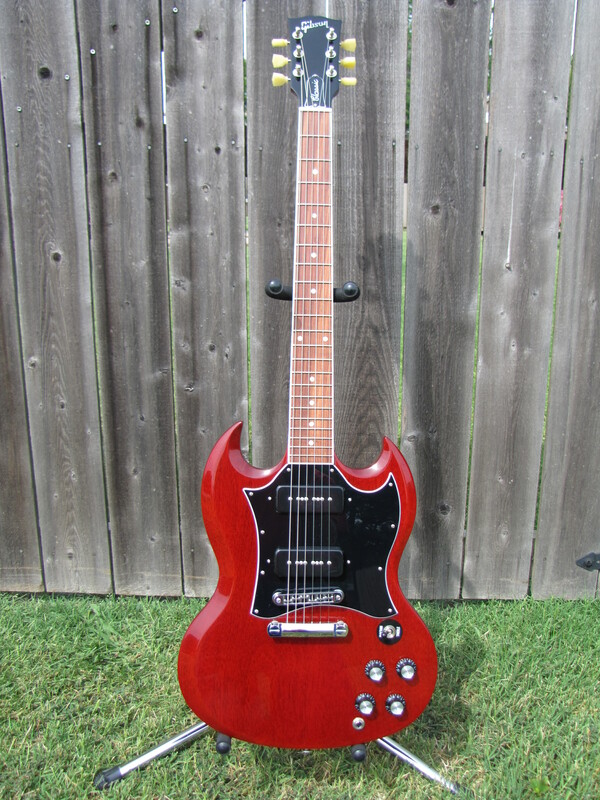 The SG Standard sold for $1,199.99, and had trapezoid inlays on the fretboard. The SG Classic comes with dot inlays, and comes with a gig bag, and sells for $999.99. 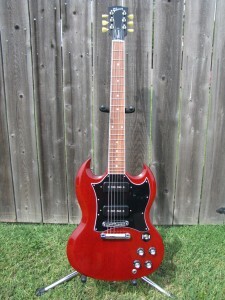 The price had just dropped on the SG Standard, so I bought it. I took the stock pickups out and had new Gibson ‘57 Classic pickups installed. These pickups are made true to the original humbucking pickups Seth Lover invented back in 1957. These are a great improvement over the stock Gibson 490R & 498T stock pickups. I have enjoyed the Standard, but I was missing that cool P-90 sound I first heard. I did some checking, and it seems Guitar Center did not have these in stock at any of their stores anymore. I was worried maybe Gibson was going to discontinue these, so I decided to get on the stick and order one of these SG Classics. 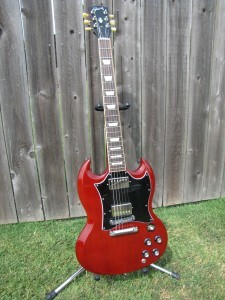 I had to have my Guitar Center salesman friend at Tulsa, order this guitar through GuitarCenter.com. I ordered it on 03/05/12, and received it 3 days later on 03/08/12. I was very happy to find mine came with the Keystone style Kluson tuning machines instead of the button style that Gibson used to use on these guitars, which I did not care for and would have had to change, so hey, money saved right there. The guitar was just beautiful in every way. The grain of the mahogany was very fine. Fit & finish were all top notch. I could not find a flaw anywhere. The guitar is a pleasure to play, and for the money, (I got a great discount), you can’t go wrong! I ordered the hardshell Gibson case for mine. I got my guitar in the heritage cherry finish, and it looks so fine and traditional. I found out from Gibson, the strings they install at the factory are Gibson Brite Wires. I found the 10-46 gauge strings on this guitar are perfect for it. I usually play 9-42, but this sounded so much better on the high E & B strings with 10-46 gauge. The sound was really apparent with this gauge. You can get some nice blues riffs out of the P-90’s. They’re like single coils on steroids. good and powerful, but yet very clean. I can see why Pete Townshend liked this style of SG so much back in the day with The Who, or Carlos Santana at Woodstock in 1969. What a sound! So there you have it, a great looking & sounding guitar for a very good price! This guitar is very reasonable on the pocketbook, and is light to play. Get one while you still can because this guitar rocks. This is a keeper for me. Kudos to Gibson for such great quality on this guitar.